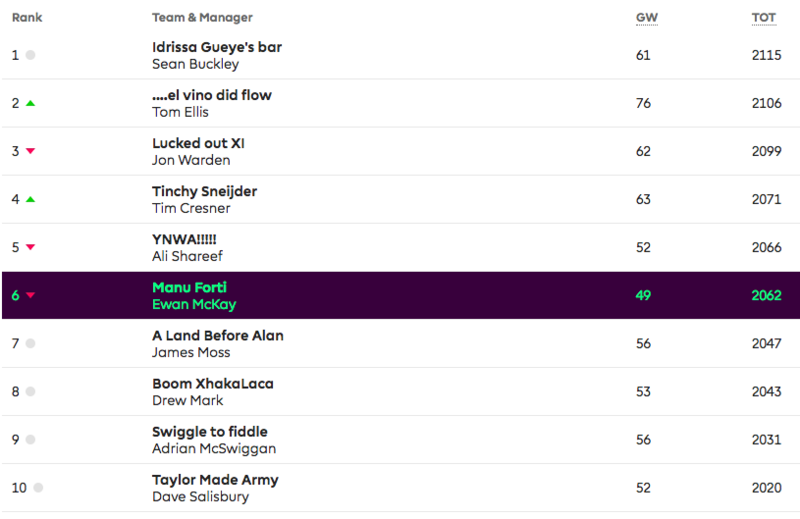 After another strong week from the top three managers in our fantasy football league, it’s now ridiculously tight at the top with only 16 points dividing the top 3. I think it’s fair to say that everyone else is out of it unless they pull off a ridiculously lucky captaincy or Triple Captaincy (TC) choice. Tom Ellis had a cracking game week ranking circa 30,000 for the week with big hauls coming from Sterling, Zaha and a Jesus captaincy. 61 and 62 for Sean and Jon were also well above the average which leaves Sean placed 37,000 overall. Very impressive. So what chips do they have left? With a double game week coming I think it very much might come down to chips. Sean still has his TC but doesn’t have Jesus or Kane in his side. He might TC Sterling or Eriksen or he could move for one of these players. If Kane then he’ll likely be taking a -4 hit. Tom also has his TC. Captaincy contenders currently look like Sterling and Jesus. Again, no Kane and it looks like he’ll go without. Jon has Bench Boost. This could be big although it doesn’t look like he can field 15 players without taking some significant hits. Furthermore, all his players will not be double game week players. He has two Liverpool players in Firmino and Salah for example. That said, you’d take those two for one week. I could see Firmino being rested though. Milivojevic is another with one GW. Jon doesn’t have Kane either and it looks like hits would be required to bring him in. So Kane could be a big differential here. He has WBA away and Newcastle at home. We’ve seen him splurge at the end of the season before to win the golden boot award so we know he can do it. But he hasn’t shown that kind of form recently, although a goal last night helps his prospects. Maybe it’s best to ignore Kane and go for a Man City player. Their DGW is Hud home and BHA home – both fantastic games but rotation is going to be the worry. There’s a good chance Sterling will not see 180 minutes. Jesus maybe so but he’s not prolific.